The quantity of features in electronic meters has never been greater, and the prices have never been lower. But, are they any good? 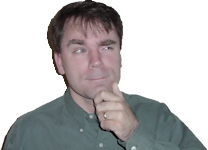 In Chapter 4 of Robot Building For Beginners, I describe most multimeter features in detail. For the second edition, I needed to purchase three new meters (cheap, mid-range, and higher-end) to update the comparison section of the chapter. During the selection process, I was surprised to find so many feature-rich meters for so little money. The cheap multimeters must be junk! I chortled to myself. Upon being received, each new multimeter was used to measure precision components and various circuits. Then, the meters were opened for inspection. The accuracy, physical quality, feature set, and price were then scored to provide recommendations. Given the large number of digital multimeters (DMM) on the market, and given how often meter manufacturers refresh their lineup, the exact models listed in this article will probably be unavailable within a year. However, this should still provide you with suggestions on techniques for comparison shopping on your own. Before getting into the comparison tables, let’s introduce each meter and any interesting positives or negatives along the way. This was my first real multimeter. I purchased it to learn electronics in 1999. At the time, it cost $100 because it had so many features. Although it is labeled “RadioShack”, it’s most likely manufactured by Metex. This is an appropriate meter to start with because it is over 10 years old. We’re looking to see if newer, less expensive meters can beat it. The only thing that I don’t like about this meter is that it has a manual range rather than an autorange. This means the dial has to be adjusted based on the approximate range of the component that the meter is measuring. Not a big deal, just an inconvenience. Inside a multimeter with a shield, fuse, socket, spare fuse, 9V battery with sleeve, and hard plastic snap. Like most good multimeters, there is a metal or foil shield over the meter circuit board to prevent stray electrical signals or electrical noise from altering the measurement results. The fuse for current measurement is in a clip holder for easy replacement. There is a spare fuse holder in the battery compartment. This is much more convenient than hunting for the meter packaging when you’re already frustrated by a blown fuse. The meter uses a 9 V battery, which is compact, readily available, and provides enough voltage to light white LEDs during diode testing. Furthermore, this meter includes a thin plastic cover to prevent battery leakage from harming the electronics. Look at the thickness of that battery snap! This isn’t a weak, flimsy battery snap that belongs on toys. Here is an eBay special: $6.50, which includes shipping. I kid you not! Resistance (up to 2 megohm), but no continuity buzzer. Soldered fuse and wire fuse in the 830B multimeter. 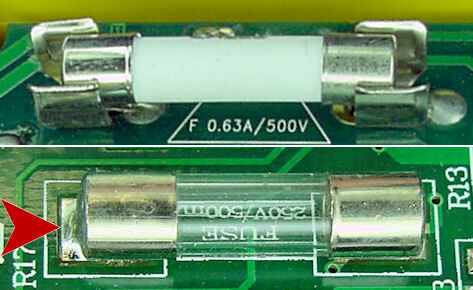 The low-current fuse ① is soldered to the board. If you blow the fuse, you'll blow your fuse trying to desolder it from the sensitive electronics. 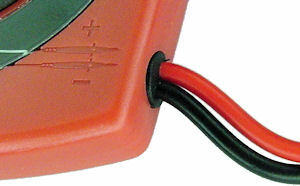 Also, the high-current fuse ② consists of a big wire with a slice in it. 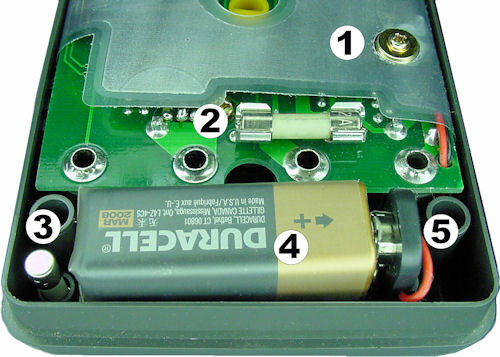 Soldered battery springs in a multimeter. They didn’t use a battery snap, instead they soldered two springs to the PCB. I’m concerned that the springs are going to deform or break off when I attempt to replace the battery. I suppose I should be happy that they didn’t solder the battery itself to the motherboard. 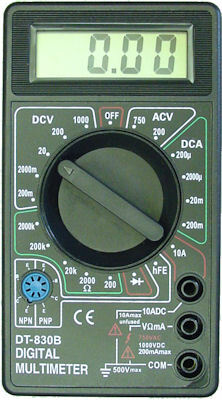 Jameco BenchPro 1562 digital multimeter. 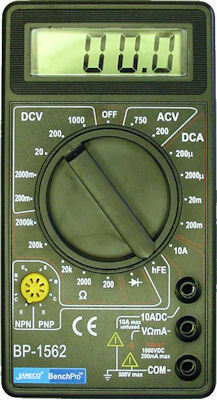 At first glance, this Jameco Electronics meter looks identical to the DT-830B, except for a yellow transistor socket. However, on the inside they have differences. 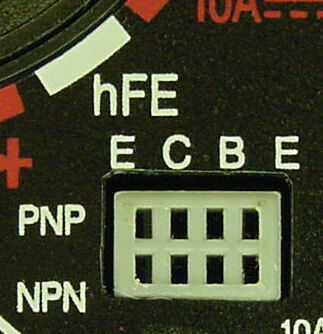 This low-end Jameco Electronics meter has a socketed fuse, rather than soldered on. Also, it has a battery clip (albeit flimsy) rather than soldered-on springs. Furthermore, the front jacks are good enough to hold the test leads. For $10.95 (not including shipping), this includes all of the measurement features of its weaker sibling. The Trisonic was also obtained on eBay, for the mere price of $7.69 (including shipping). 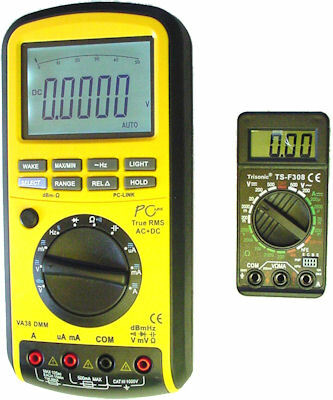 This multimeter has all of the features previously mentioned of the other two inexpensive meters, including the manual dial. 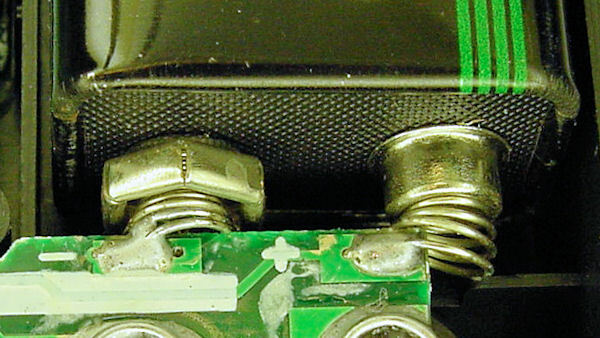 It has a rectangular transistor socket, as opposed to round. That doesn’t make any functional difference. Trisonic transistor gain hFE test socket. 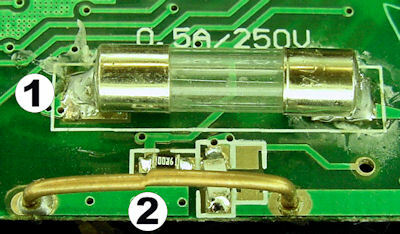 Fuse holder (good) versus soldered fuse (not good). One of the unusual aspects to this multimeter is that the power source is a tiny 12 V battery. 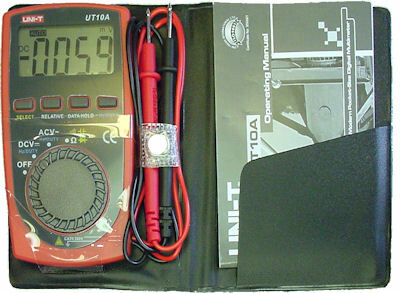 Trisonic multimeter uses a 12 V battery. The higher voltage but smaller size of #23A 12 V battery suggests a smaller capacity, which means a shorter lifespan than a 9 volt battery. Although not as common as a 9 V, you can probably pick up a 12 V at the local hardware store in the watch battery or garage/car remote aisle. There’s not much of a need for 12 volts in an ordinary digital multimeter. So why did they choose that type of battery? Difference in digital multimeter sizes. The answer is: the Trisonic is a very tiny multimeter. It’s about the size of three 9 V batteries combined -- or about the size of a folded up clamshell mobile phone. This multimeter fits in your shirt pocket. They chose the 23 A 12 V battery because it is smaller than a 9 V battery. While we are on the subject of small multimeters, here is a calculator-size multimeter. It even comes in a calculator pouch. It won’t hurt your wallet at $18 (including shipping). It also has relative and hold mode. It claims to have frequency and duty cycle, but it apparently only works for sin waves, which is much less common than square waves in digital circuits. On the downside, it lacks current measurement, which is a major gap. But then again, that means it doesn’t need a fuse. There is another feature it lacks: the ability to test blue and white LEDs. Why? UT10A multimeter 3V coin cell. This multimeter uses a coin cell, befitting its calculator size. 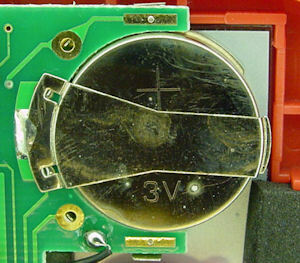 After passing through the meter’s circuitry, the coin cell is unable to deliver enough voltage to light a white LED. Although this isn’t a kiss of death, it makes it less useful for sorting LEDs. Also, it is less common for you to have a spare coin cell, as opposed to a 9 V battery. UT10A multimeter has hard wired test leads. The third sacrifice they made (current measurement and white LEDs being the other two) in exchange for the small size, is that the test probes are permanently connected. Multimeter test leads with banana plugs and sockets. 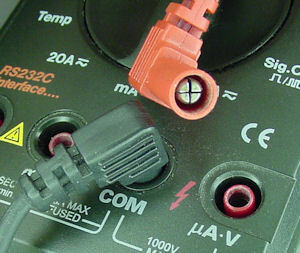 The major benefit to having a meter with jacks is that you can use the variety of adapters and replacement probes. All of that being said, these are design choices based on form factor. If you’re interested in a pocket-size multimeter, you can’t expect the same features and flexibility of standard-size models.